American and Russian technology once poised to annihilate the enemy country will come together for a peaceful and historic marriage on Monday afternoon at Cape Canaveral. There were will be the usual rumble and smoke at the Cape's launch pad 36B but this won't be your typical rocket lifting off. Instead, a new chapter in the annuals of space history shall be written as the first American rocket to use a Russian-made engine takes to the skies. More ironic is the heritage of the Atlas which once stood as an Intercontinental Ballistic Missile aimed at the Soviet Union, and the Russian engine technology can be traced back to that country's Cold War missile system pointed toward the U.S. It is a further indication that the Cold War is truly over, launch officials say, as preparations continue smoothly for the maiden flight of Lockheed Martin's Atlas 3A rocket. "The world has changed," said Vladamir Chvanov, first deputy general director and general designer for NPO Energomash, builder of the Atlas 3 engine. "I think now in this world no one country or no one enterprise can achieve the targets that we have in front of us, so we have to work together in close cooperation in order to achieve what we plan to do." In addition to the rocket, the satellite cargo to be delivered into Earth orbit also has an international flare. 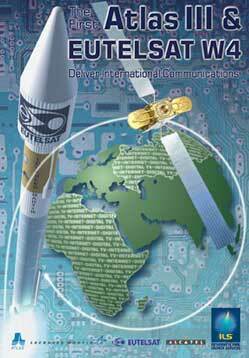 The W4 satellite will be operated by a European telecommunications consortium EUTELSAT, it was built in France, has Russian parts inside and will provide TV, Internet services and business communications to Russia and Africa. Engineers first went to the drawing board seven years ago to design what is now known as Atlas 3. Their objectives were to design a better and more powerful rocket than the current Atlas 2-series. "When we started on the Atlas 3 system, we wanted to provide a vehicle that gave things to our customers that demand: more reliability, less cost, more performance and a more operable system," said John Karas, a senior Lockheed Martin official who helped develop the Atlas 3. To improve reliability, the Atlas 3 will use just two rocket engines instead of the nine needed by the Atlas 2AS, previously the most powerful Atlas rocket available. A global search was launched in 1994 to find the best rocket engine possible, Karas recalls, and the Russian-designed RD-180 was found. It was selected on December 20, 1995, and a new partnership between the East and West was born. The RD-180 was developed by NPO Energomash of Khimky, Russia, building upon the proven heritage of the RD-170 powerplant incorporated into Russia's Energia-Buran space shuttle, the Energia-M and Ukrainian Zenit rockets. The engine is considered to be the most efficient in its class. It consumes RP-1 fuel, a highly refined kerosene, and super-cold liquid oxygen. Each $10 million powerplant has two thrust chambers and two bell-shaped nozzles that swivel during the launch to steer the rocket. The engine produces 933,400 pounds of ground-shaking thrust. It can be throttled up and down to ease the stresses the rocket experiences throughout the three minutes and two seconds the engine will be fired during a typical launch. Because of the RD-180 guzzles more liquid oxygen than American-made engines used on older Atlas rockets, the Atlas 3's first stage was stretched 10 feet to accommodate the longer oxidizer tank. Pratt & Whitney Space Propulsion of West Palm Beach, Florida, financed the near-$100 million development of the RD-180 for the Atlas 3 program. Pratt and NPO Energomash are equal partners of RD AMROSS, the joint venture formed to market, sell and distribute the RD-180 engines. The RD-180 also will be used by the futuristic Atlas 5 line of rockets scheduled to debut in the spring of 2002. Lockheed Martin has ordered 101 engines for $1 billion. Given the extra boost from the RD-180, the Atlas 3A rocket to be launched Monday will needed just one upper stage engine. 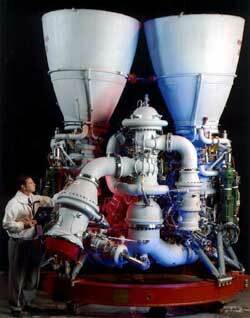 Previously, the cryogenic-fueled Centaur stage used a pair of Pratt & Whitney's RL-10A-4-1 engines. Otherwise, the Centaur remains the same except for some minor structural changes to support just the single engine. The Atlas 3B -- to make its first flight next year -- will use an enhanced Centaur stage with two engines to lift even heavier payloads to orbit. If you put the Atlas 2AS rocket -- the current workhorse for Lockheed Martin's commercial efforts -- side-by-side to the Atlas 3A, the most noticeable difference is the new rocket is 10 feet taller. Looking more closely, you will see the first stage does not have the jettisonable "booster engine package" which separates during an Atlas 2 launch, nor does the Atlas 3 carrying strap-on solid rocket boosters like an Atlas 2AS. Comparing an Atlas 3A first stage to an Atlas 2AS, there will be just one staging event instead of five and 10,000 less parts. For the Centaur upper stage, 4,200 parts of have been eliminated and there is just a single engine. Altogether, an Atlas 3A rocket is about 25 percent cheaper. The end result of Lockheed Martin's $300 million Atlas 3 development effort is two versions of the Atlas rocket that cost less and can deliver heavier satellites to space. Such improvements position the company to attract a larger share of the fiercely competitive and lucrative commercial launch market. "We are really proud of what we have accomplished and we are ready to fly," Karas told reporters on Friday. The Atlas 2AS is able to carry 8,200 pounds of cargo to geosynchronous transfer orbit, the egg-shaped temporary orbit around Earth used by communications satellites to ultimately reach their perch 22,300 miles high. The Atlas 3A can launch 8,950 pounds and the later Atlas 3B will lift 9,920 pounds. In a marketplace where satellites are becoming heavier and new competing rockets are joining the scene, Atlas fleet had to grow. But proving the new Atlas 3 works is the next crucial step. "This is very important not only for our near-term customers but our future customers," said Karas, who is now the vice president for Lockheed Martin's Atlas 5 program. Lockheed Martin sees the Atlas 3 as evolutionary step to the next-generation Atlas 5 fleet of vehicles to begin flying in two years. The Atlas 5 is being developed as part of the U.S. Air Force's Evolved Expendable Launch Vehicle program and will feature several different versions with varying lift capabilities. Lockheed Martin has waited almost a year to launch its new Atlas 3 rocket. A summer 1998 launch date was scrapped when the original customer for the maiden Atlas 3 -- Loral Space and Communications -- decided to against using the unproven rocket at the last minute. 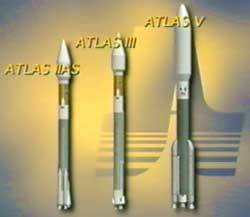 At the time, the Atlas fleet was grounded due to concerns with its RL-10 upper stage engine. Instead of using the Atlas 3, Loral chose the rival Arianespace Ariane 4 rocket to loft the Telstar 7 TV satellite last September. The Atlas 3 rocket had to be removed from the launch pad and placed into storage until Eutelsat stepped forward and bought the inaugural Atlas 3 ride. "Loral is a very good customer for ours. They were our customer from the beginning of the Atlas 3 development," Karas said. "If I was in their position, I would do the same thing. They wanted to get up, it was a high revenue bearing spacecraft." The Atlas 3 family will likely only see 12 to 18 launches before being phased out in favor of Atlas 5, which promises to be even cheaper and more efficient, Karas said. The second Atlas 3 launch could come this December if a customer is found. 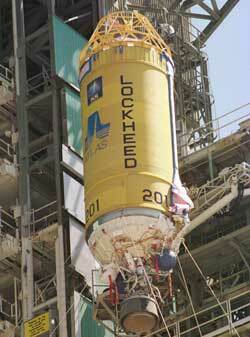 The first Atlas 3B is targeted for March or April of 2001, and Atlas 5 will debut in March 2002. Atlas 3 flights will continue in 2002 and 2003 to provide a stable overlap during the introduction of Atlas 5, should problems develop with the new launcher. Currently, five Atlas 3s have been sold to EUTELSAT, Loral Space and Communications and the U.S. government. Karas believes the sales will pick up if Monday's launch is successful. "I think there is a lot of pent up demand in the marketplace. The best sales events are our launches." Officials know the space business can be a roller-coaster of emotions. One moment you feel the incredible thrill and pride of watching a rocket scream off the launch pad. The next can be the gut-wrenching agony of defeat as a fireball fills the sky from an exploding rocket. The first launch of any rocket is dicy. Some historians put the odds of a successful maiden launch at about 50 percent. Also fresh in everyone's mind are the malfunctions of the first European Ariane 5 rocket and two straight setbacks for new Boeing's Delta 3. "We honestly believe we have done everything we can to ensure success," said Ed Christiansen, the Lockheed Martin launch conductor for the Atlas 3 maiden flight. "But we are mindful this is the first launch." "You can never be too cautious when you are launching a rocket, whether it is the first or 50th," Karas said. "We have done a lot of ground testing, but until you fly, you never know." Monday's countdown will begin at 8:47 a.m. EDT (1247 GMT). Soon thereafter, the rocket will be powered up and final pre-launch preparations will get underway. Retraction of the mobile service tower at pad 36B, exposing the fully assembled rocket for the first time, is slated to occur at 2:37 p.m. EDT (1837 GMT). Fueling operations will commence at 3:51 p.m. EDT (1951 GMT). The launch team will have two hours and 20 minutes in which to get the rocket airborne on Monday or else wait until Tuesday or Wednesday. Lockheed Martin has reserved all three days on the Eastern Range. The launch window remains unchanged for the three attempts: 5:37 to 7:57 p.m. EDT (2137-2357 GMT). Spaceflight Now will provide extensive live coverage of Monday's launch with our Mission Status Center reports and a streaming video broadcast that will include views from two cameras mounted onboard the rocket. Spaceflight Now is providing extensive live coverage of today's launch with our Mission Status Center reports and a streaming video broadcast that will include views from two cameras mounted onboard the rocket.